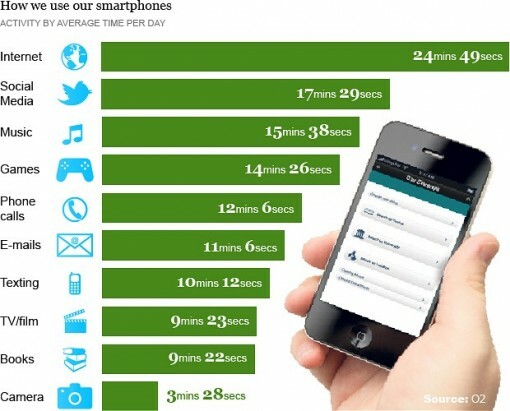 What do you use your smartphone for most of the time? Off the top of my head, I say I use my phone for texting and checking Twitter. A close second comes reading ebooks. Making phone calls comes in third, at best, that is. We probably do not need a study to tell us that many people do not use their smartphones to make a lot of phone calls, but in case you like having proof to back up your statements, there is this study conducted by O2, one of the leading UK mobile networks. Based on a report published by The Telegraph, the results show that on the average, people use their smartphones two hour per day. The top four uses are as follows. Making or receiving phone calls made it fifth on that list, with only a slight advantage over checking emails and sending/receiving text messages. Here’s a graphical representation of smartphone usage based on the study. As I mentioned earlier, it really is not a surprising turn of events. While there are still people who prefer speaking over than phone than conversing via text, there are many factors to consider. One of these is the fact many people are on a data plan that allows them to connect to the Internet constantly (or almost constantly). That being the case, Twitter, Facebook, and other similar platforms allow people to connect with friends in a more convenient manner, not to mention cheaper. Another point to consider is that even if smartphone owners do not have an unlimited (or near unlimited) data plan, there usually is Wi-Fi connection in the area. 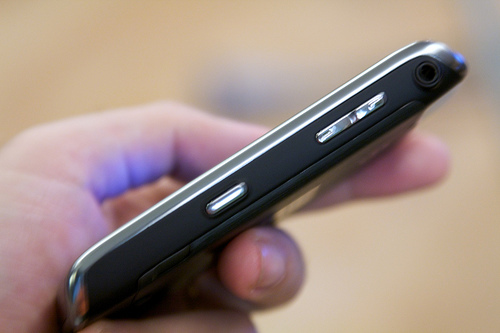 This is a trend that is only going to gain traction, and this naturally means changes in phone usage habits of people. So, if you were part of the study, how would you rank those activities you engage in using your smartphone?